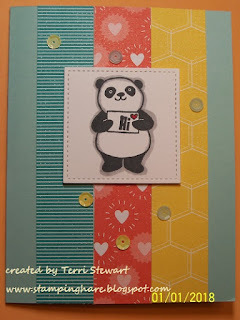 As promised below are the ingredients and measurements for my 2018 sale-a-bration blog hop projects featuring the Party Pandas stamps; click here to follow the hop. Drop me a line if you have questions, I'm happy to answer! Pool Party cardstock (cs) (#122924), 8.5 x 4.25"
Bubbles & Fizz designer series paper (DSP) (#147244), 3 patterns, 1 x 5.5"
Tutti-Frutti designer series paper (DSP) (#145606), 3 patterns, 1 x 5.5"
white cs (#100730), 8.5 x 5 .5"
Painted with Love specialty (DSP) (#145580), 3 patterns, 1 x 5.5"
click here to see a short video explaining how to extend an image outside of a punch; my card project used the same technique with the stitched framelit square die. Happy New Year! I'm celebrating the new year, Stampin Up's newest catalog, the Occasions catalog, and the best time of year, Sale-a-Bration (SAB)! 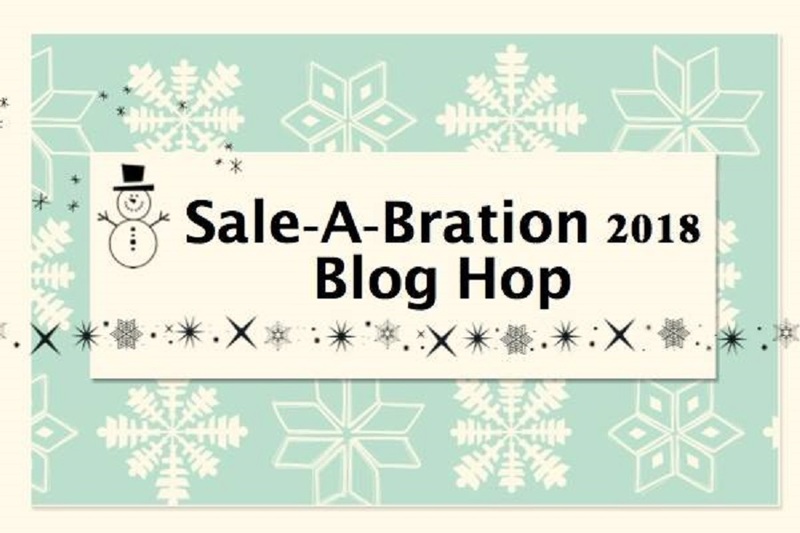 Welcome to the 2018 Sale-A-Bration blog hop. We have lots of creativity to share with you featuring Sale-A-Bration 2018 products. For those who don't know me let me introduce myself. I attended my first Stampin' Up! workshop in 1996 and have been a Stampin' Up! 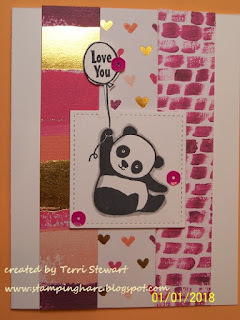 demonstrator since 2010--I am passionate about stamping! I live in central Maryland; if you ever find yourself in the area, look me up and come stamp with me! My projects feature the SAB set Party Pandas. 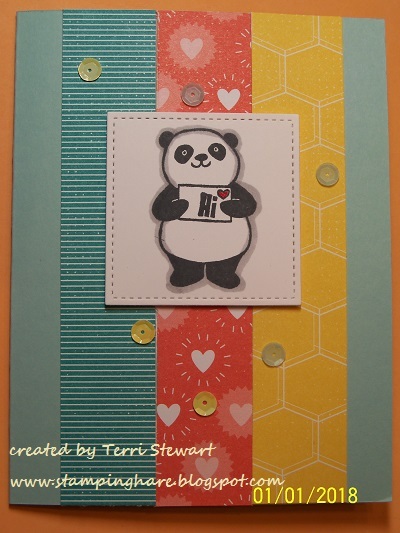 These pandas are too darn cute, especially when paired with other SAB items and designer series paper (DSP)! 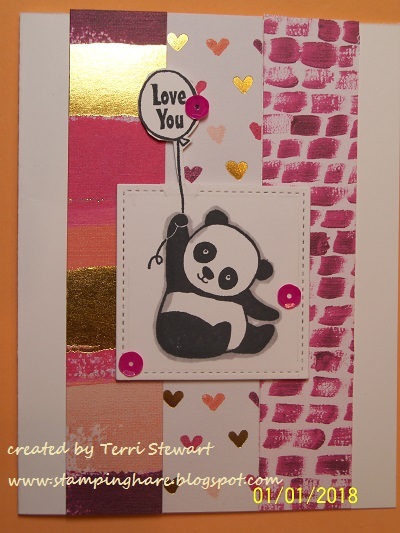 I stamped each panda with Tuxedo Memento black ink on Whisper White cardstock then outlined them using the Light Smokey Slate Stampin' Blend marker--it really makes them pop, like they are 3D! 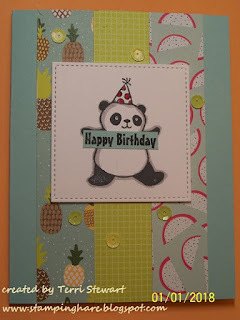 I dressed each card up with the Tutti-frutti adhesive backed sequins from the Tutti-Frutti suite in the Occasions catalog for easy-peasy embellishing. Check back tomorrow for a full ingredients list and measurements. Make sure you keep hopping along to see all the other Sale-A-Bration projects! Click on the "Next" button below to visit Twila Davis' blog. 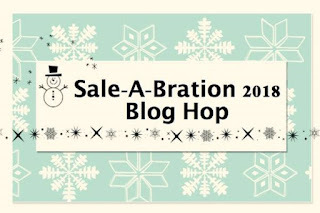 Don't know what Sale-A-Bration is all about? It is an annual event where exclusive products are earned for orders placed. A minimum $50 purchase is required. You can earn as many Sale-A-Bration products as you would like too. If you are ready to place your Sale-A-Bration order and don't already have a demonstrator, I would be happy to be yours. Click this link to go to my online store. Catalogs are available there as well.